The front wheel tap sometimes described as "touch-up" is one of the less intuitive techniques of trials riding. 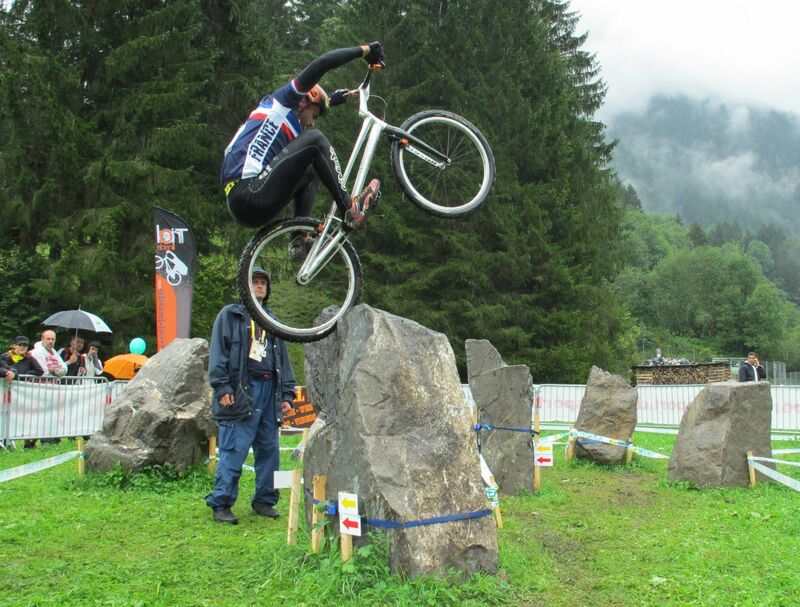 Hitting the upper edge of an obstacle with your front tyre just boosts tyre compression and its associated bounce-up effect. Both tyres get squeezed as you hit the obstacle. 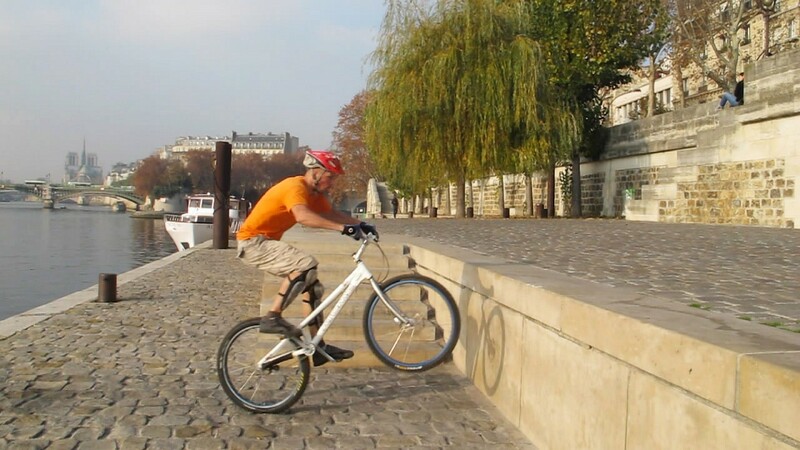 It is very much like a pedal up technique, but with the extra complication of hitting the upper edge of the obstacle with your front tyre during the acceleration phase of a pedal kick. 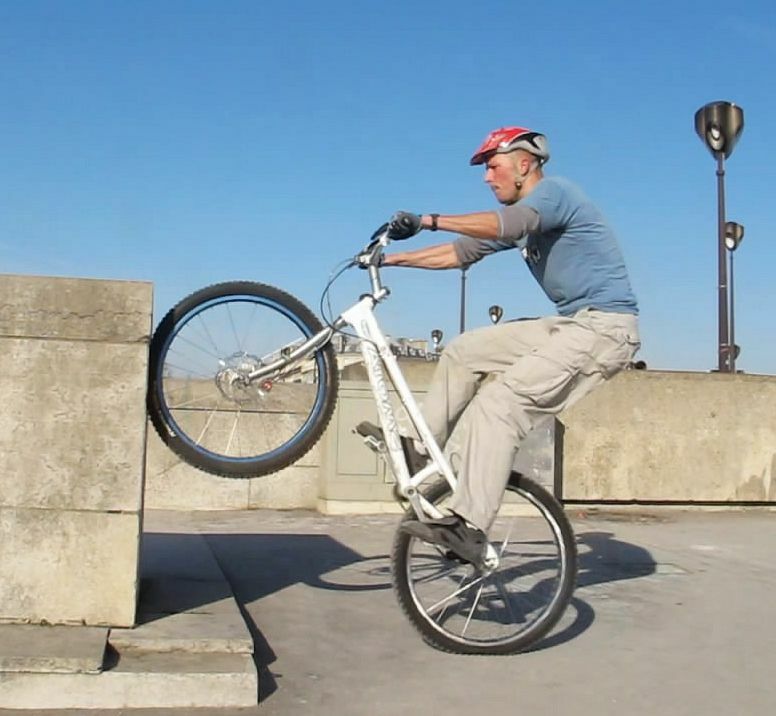 The added compression boosts the upward lift of the bike and makes it much easier to jump, quite effortlessly compared to pulling a bunny hop or a simple pedal up. This requires much less run-up distance than a bunny hop and offers much more control too. This technique is a good alternative to the roll-up approach if you want to climb on a sharp edge with not much room behind. Rémy D. lands a perfect wheel tap. Like for the roll-up, you can start from a trackstand position, at least one full crank turn away from the obstacle. 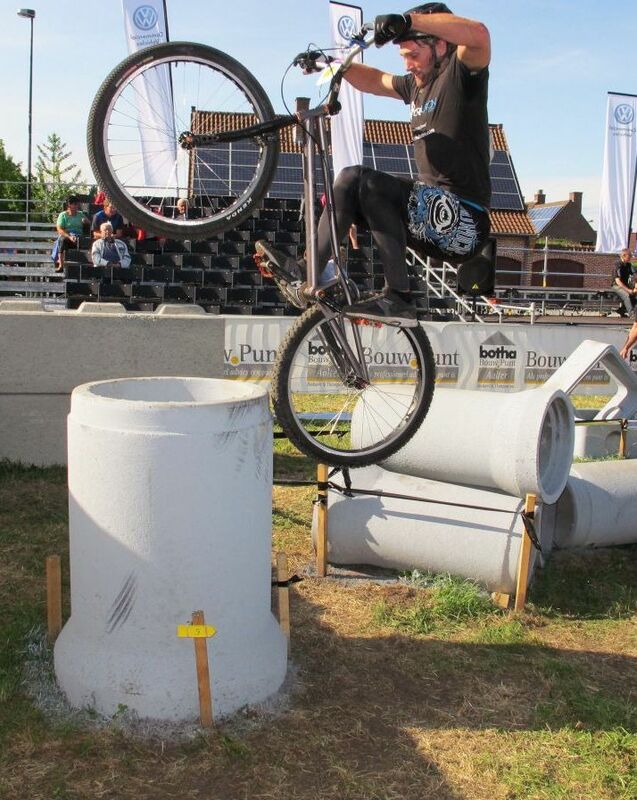 For higher obstacles you can approach at moderate speed before the pedalling action takes over. Ride the first quarter of crank turn pushing on your front foot to set the bike into motion or accelerate further from your initial speed of approach, and crouch progressively. 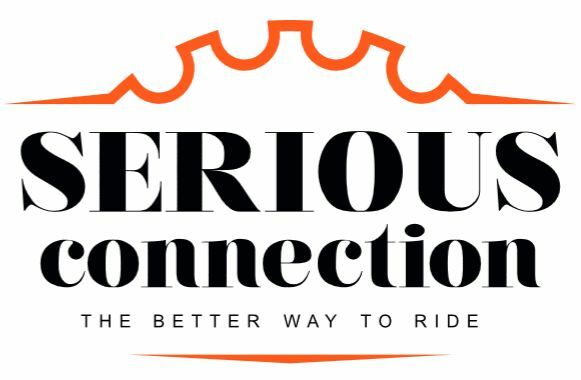 Follow up with the second quarter turn pushing on your lazy-foot pedal, leaning back and pulling on the handlebars to aim the front wheel right at the edge of the obstacle. Accelerate the move on your good-foot again, ready to spring up into a full extension while kicking on your front pedal to hit the upper edge of the obstacle with your front tyre. Upon impact, both tyres get compressed nearly flat, caught between the top of the obstacle and the ground. To achieve maximum tyre compression as the front wheel hits the edge, withstand the impact by firming up your arms. After this compression phase, you should finish off the jump impulse in synchronization with the rebound phase. 1° Ride the first quarter of crank turn pushing on your front foot to set the bike into motion and crouch progressively. 2° Follow up with the second quarter turn pushing on your lazy-foot pedal, leaning back and pulling on the bars to lift the front wheel. 3° Accelerate the move on your good-foot again, ready to spring up into a full extension while kicking on your front pedal to hit the upper edge. 4° To achieve maximum tyre compression as the front wheel hits the edge, withstand the impact by firming up your arms. 5° After this compression phase, finish off your jump impulse in synchronization with the tyre bounce-back effect. 6° After take-off, pull the bike further up with your arms, tucking your knees to let the rear wheel reach its destination. A split second after the impulse, the tyres bounce back from their compression and boost the bike upward. Pull up the bike with you and tuck as much as you can to let the rear wheel move up on the edge that you just hit with the front wheel. 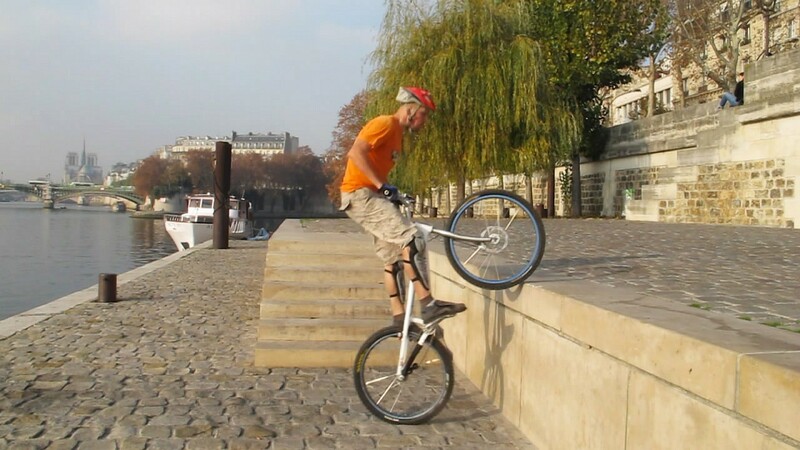 Lock the rear brake to secure your grip and adjust your balance. If necessary, move closer to the handlebars and lean forward to let the bike tilt forward again. Hit below the edge to maintain the 45 degree compression angle. Ideally, the front wheel just hits the edge and rolls off it, so you shouldn't even touch the front brake. 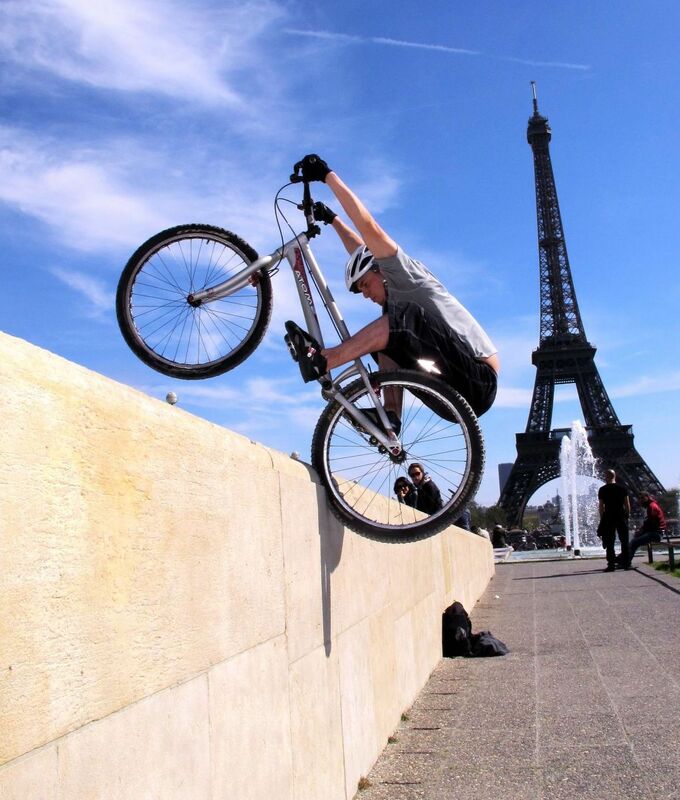 Best is to keep your forefinger on the bar grip to avoid accidental braking. 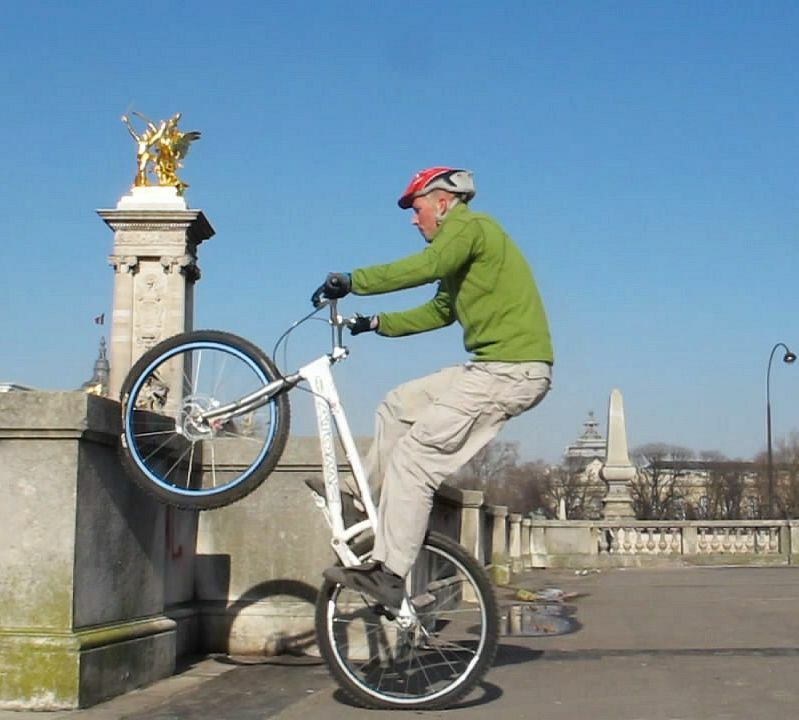 The trick is to synchronise the jump impulse on the pedal with the wheel bang. When the front wheel hits the edge, both tyres are compressed, and during that split second, you can really give the maximum jump extension on top of the pedal kick with maximum support from the ground. Mechanically, the best compression will be achieved when the bike's wheelbase makes an angle of 45 degrees with the ground, which means that for higher obstacles (above the handlebars), it is best to hit the front wheel slightly below their upper edge to maintain that angle. Finding your marks is key, so that you reach the wall with your strong foot forward. Focus on finding the best synchronization of body language with the acceleration phase and pedal kick when the front wheel hits the obstacle. Giacomo Coustellier tucks after a massive tap. Andrei Burton on his way up as the tyres bounce back. The bouncing effect works even on fairly low steps, so start small to feel and understand the move. With practice, you can also fine tune or adjust the power of this technique by modulating the tension in your arms. You will get a softer reaction if you damp the impact, or a more dynamic and powerful move up if you firm up your arms. If you hit the front wheel too high on the edge, it will mostly roll over it and you won't get that extra acceleration upward. 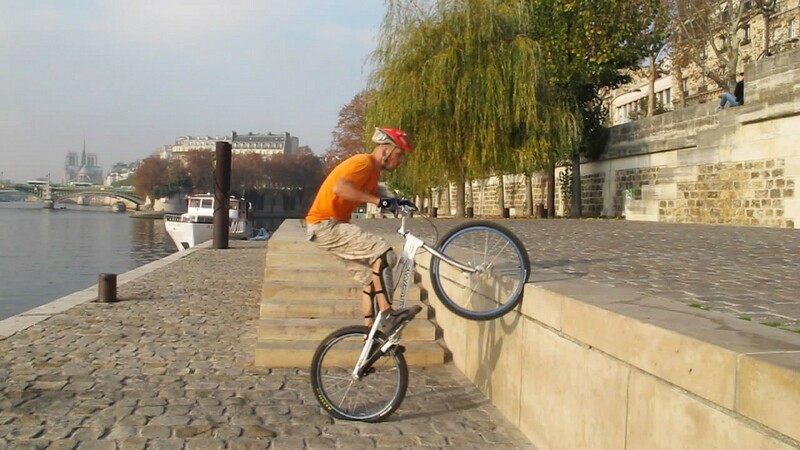 As in many pedalling techniques, the more momentum you put into the move, the easier it is to reach the obstacle after take-off, but it is also riskier if you hesitate or if you get your marks wrong. This works on railings if you are precise enough. If the edge is very square, the wheel tap too harsh, or the pressure in the front tyre too low, you can pinch your front tyre flat. The touch-up technique will definitely bring another form of abuse to your bike. Even when fairly well mastered, this technique has an excellent potential to buckle many wheels and is well known for breaking old forks. Mentally, you can narrow down the section of the obstacle you hit to a horizontal line. Then you'll be ready to use this technique on railings or very precise corners. 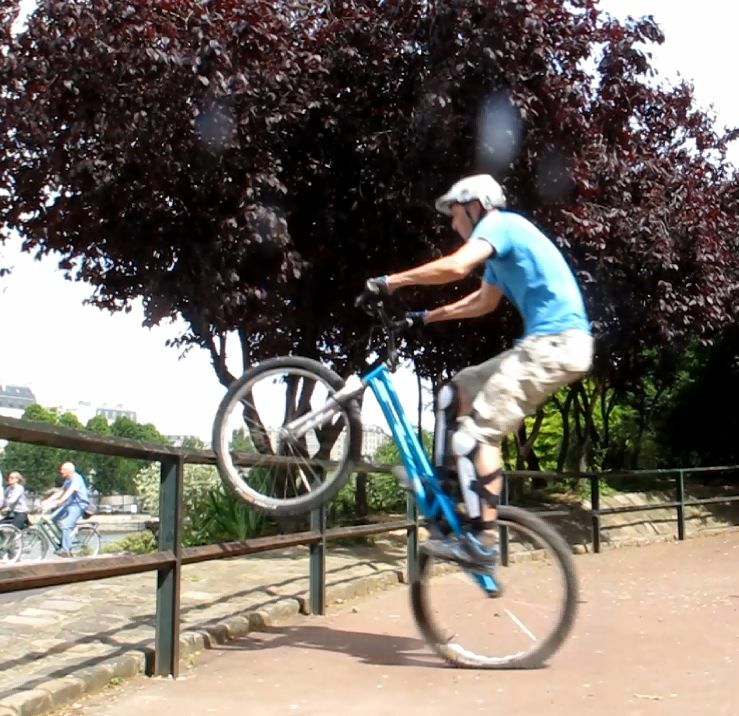 Front wheel taps were very popular until around 2008, as part of the TGS (taps, gaps, side-hops) panoply of urban riders. Evolving geometries and higher bottom brackets have turned pro-riders more in favour of high roll-up and pedal up techniques to nose-pick.